Since being introduced to American women in 1960, birth control pills have been lauded as a giant step toward sexual and reproductive freedom for women. However, because these pills work by introducing synthetic hormones to the body, they can upset the balance of natural hormones. 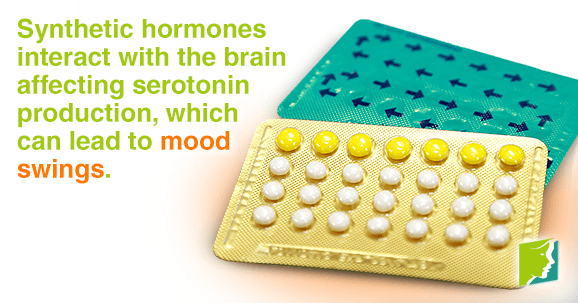 This disruption of hormones can trigger mood swings and even depression in women. In fact, women are more likely to become severely depressed if they are taking hormonal contraceptive. How can a pill that's supposed to give you more freedom actually end up harming you? Read on to learn more. The most common form of birth control is oral contraception (the pill). There are currently 35 different brands of birth control pills available across the United States. Other methods of birth control include barrier methods, like female and male condoms, hormonal methods, like the patch and vaginal ring, and implanted devices, like intrauterine appliances. Most of these methods rely on hormones. Why Do I Have Mood Swings on Birth Control? Most pills contain synthetic versions of the hormones estrogen and progesterone. Additionally, the popular mini pill, only contains progestin (synthetic progesterone). When these hormones interact with the brain they act in two different ways to lower serotonin (happy hormone) levels. Firstly, they directly suppress the brain's production of this chemical, and secondly, they release power chemicals that act as inhibitors to the brains serotonin. The end result can take the form of low or fluctuating moods. What Are Other Side Effects of Birth Control? The most common side effects of hormonal oral contraception's include: loss of libido, spotting between periods, tender breasts, headaches, nausea, and weight gain. If you experience any of these symptoms you should contact your doctor because they could indicate a serious disorder. However, birth control medication can sometimes have pleasant side effects, such as easing your premenstrual syndrome (PMS) and curing facial acne. If you feel like birth control is responsible for your mood swings, talk to your doctor about switching to a different brand or method. Remember that pills, patches, and vaginal rings are all medications and will come with side effects. Always tell your doctor that you are on the pill before taking any prescribed medications. If you decide to stop taking the pill altogether, your symptoms should disappear with time. Mood swings are a common symptom of perimenopause. Click here to learn more.